G. Mensinger [Mentzinger], c. 1862-1867. Lyon, Shorb & Company Collection, Library & Archives at the Heinz History Center. Used with permission. The Historic Pittsburgh Image Collections is part of the Historic Pittsburgh web site hosted by the University of Pittsburgh's Digital Research Library (DRL). Since its inception in 1999, the Historic Pittsburgh web site (http://digital.library.pitt.edu/pittsburgh/) has grown from its rudimentary roots to become a mature and popular online resource serving the western Pennsylvania scholarly and research community, as well as displaced Pittsburghers. Partnering with the Historical Society of Western Pennsylvania and the University's Archives Service Center, the DRL gradually digitized rich textual and cartographic resources, and mounted encoded finding aids describing archival collections located at each institution. With increasing public cries of "Where are the photographs?" the DRL turned to the Institute of Museum and Library Services (IMLS) to address help this need in 2002. With the addition of a new partner (Carnegie Museum of Art), the University of Pittsburgh received a National Leadership Grant from IMLS to embark on a library and museum collaborative effort to create a single Web gateway for the public to access thousands of images documenting Pittsburgh's visual past. At the end of this two-year grant, the project team had selected, digitized and described over 7,000 images from twenty-seven photographic collections. The digitized images are drawn from many of the well-known photographic collections held by the three cultural heritage institutions, such as the Pittsburgh City Photographer and William J. Gaughan (Homestead Steel Mill) collections at the University of Pittsburgh, the Charles "Teenie" Harris collection at the Carnegie Museum of Art, and the Allegheny Conference on Community Development and H.J. Heinz Company collections at the Historical Society of Western Pennsylvania. Selection focused on images that would reflect the cultural, educational, and social development of the greater Pittsburgh region, as well as its urban structures and regional landscapes between the late-nineteenth and mid-twentieth centuries. Within this timeframe, the images portray Pittsburgh's diverse workforce and ethnic communities and neighborhoods, the iron, coke and steel industries and related manufacturing facilities, public schools and family activities, and civic renaissance efforts. 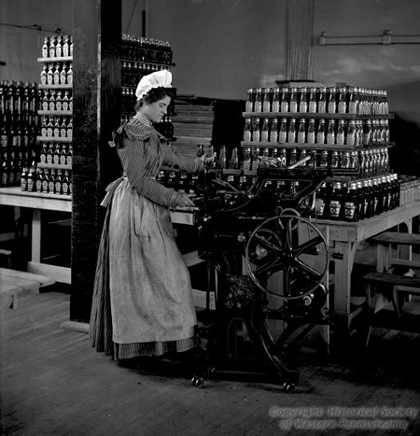 Labeling machine, c. 1901. H.J. Heinz Company Collection, Library & Archives at the Heinz History Center. Used with permission. While the image collections are searchable by keyword as a "group" or selectively, the web site features innovative avenues for exploring the images by theme, location, and time period. The rich subject headings the project team had diligently created were mined to identify a series of "stories" that could be developed as pathways into the collection. 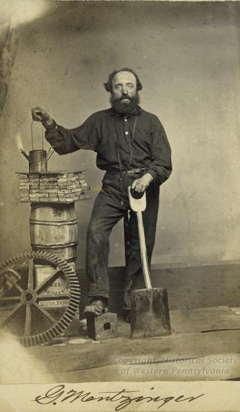 Thus visitors to the site can view images that reflect where Pittsburghers worked, how they entertained themselves, and where and how they lived. Moreover, the images can be viewed geographically by neighborhood or by time period, such as the Gilded Age, the Great Depression, and World War II. 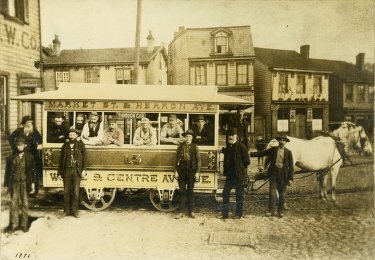 Horse-Drawn Through Car #15, c. 1888-1900, Pittsburgh Railways Company Collection, Archives Service Center, University of Pittsburgh. Used with permission. Since the web site's release on 13 September 2004, web server logs indicate an extremely high percentage of available images have been viewed by visitors each month (89%). Survey responses support the fact that the majority of users (74%) have found the images on the site to be an important source of information for meeting their research needs. The site has also helped expand the use and understanding of the collections housed at the three institutions. Although support from IMLS ended at the end of April 2005, the grant provided the tools and infrastructure to continue to mount images beyond the period of initial funding. As a result, the University of Pittsburgh continues to add images from their collections to the Historic Pittsburgh Image Collections web site. The URL for the Historic Pittsburgh Image Collections web site is http://images.library.pitt.edu/pghphotos.